Held in Birmingham, at the Birmingham and Midland Institute, Friday 25th to Sunday 27th October 2013. The city of Birmingham welcomed us once more for this occasion, the Mayor joining us for our formal dinner at Council House. The diverse programme of lectures and shows featured both local and international content as our speakers came from the UK, Australia, the Netherlands, Germany and, the final spectacular show, all the way from Japan. This was the first time a television crew followed the proceedings. 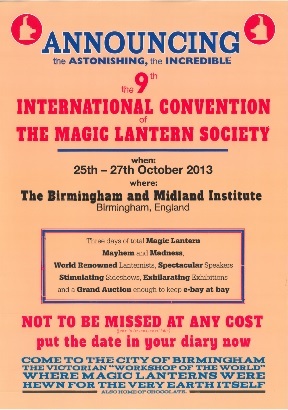 All in all, as predicted, our 9th convention consisted of three days of total magic lantern mayhem and madness, world renowned lanternists, spectacular speakers, stimulating sideshows, exhilarating exhibitions and a grand auction . A great way to hear about current and very diverse projects, exhibitions, publications, performances and more is to subscribe to the monthly New Light on Old Media, and follow us on social media.